Then, suddenly, the Graham-Cassidy Obamacare repeal bill received a jolt of energy from the Senate GOP leadership’s willingness to take it seriously. Unsurprisingly, conservative indifference to what Alexander and Murray had been up to soon soured into disapproval. After all, if states could get “significant flexibility” — as Murray was promising, in a gesture of her willingness to compromise — why go through the painful process of partially repealing and replacing Obamacare? The big guns came out for Alexander and Murray immediately. Orrin Hatch — already annoyed by the Tennessean Alexander, who Hatch thought was getting too big for his jurisdictional britches by taking turf he thought belonged to his own Finance Committee — thundered against any cost-sharing reduction deal, calling it an insurance-company bailout. Then Paul Ryan sent word to the Senate leadership that any deal worked out by Alexander and Murray would go straight into the trash can in the House. The White House sent similar messages: It was the Graham-Cassidy way or the highway. With bipartisanship on health care under renewed attack, a bipartisan group of ten governors offered support for the Alexander-Murray approach, while dissing Graham-Cassidy, in a letter to Senate leaders. “Only open, bipartisan approaches can achieve true, lasting reforms,” said the governors in an implied rebuke to Mitch McConnell’s entire health-care strategy. The most newsworthy gubernatorial signature on the letter probably belonged to Alaska’s Bill Walker, whose senior senator, Lisa Murkowski, could very well represent the deciding vote on Graham-Cassidy. 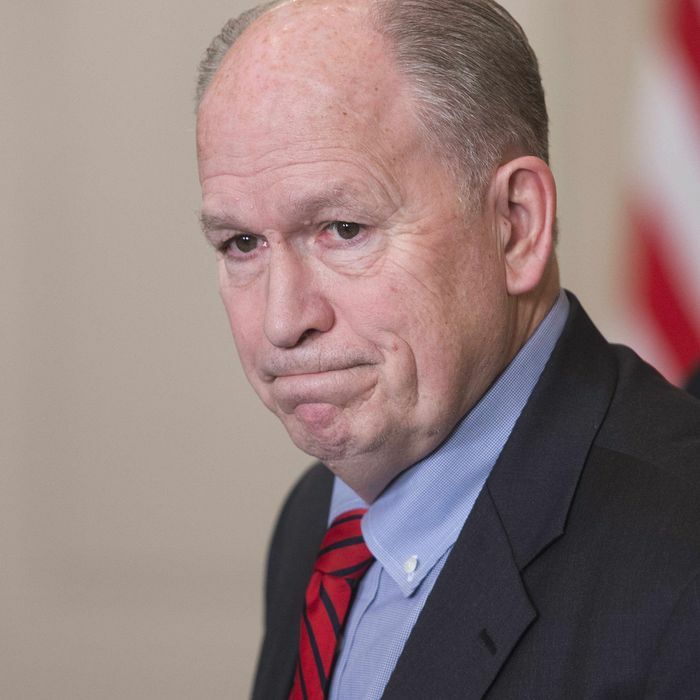 Yes, Walker is an independent aligned with Democrats in Alaska, but he still could have encouraged Murkowski to negotiate for a big bribe for her vote. Instead, he’s decided to flatly oppose the GOP bill. It’s also embarrassing for Louisiana’s Bill Cassidy — the prime mover of the current legislation — that his governor, John Bel Edwards, signed the letter, though Edwards is a Democrat. It may be even more embarrassing to original co-sponsor, Nevada senator Dean Heller, that his governor, Republican Brian Sandoval, signed on to this rebuke. During an earlier phase of the Senate health-care debate, Heller often appeared to be delegating his vote to Sandoval. Not anymore — and Nevada Democrats will be taking note that Heller is pursuing legislation his governor considers damaging to the state. Ironically, even as his handiwork was receiving some praise, Alexander announced today that the bipartisan effort he had co-led had failed. But it may still matter that five Democratic and five Republican governors are offering Alexander and Murray encouragement at a time when they’ve essentially been run off the legislative road by the big, bad Graham-Cassidy 18-wheeler. If Graham-Cassidy craters, can Alexander-Murray make a comeback? That may depend on how and when the final Obamacare repeal bill fails. If it happens after an excruciating process that raises the hopes of the conservative-base voter that they will finally harpoon the great white whale of Obamacare — say, via an October or November House vote, after the bill has triumphantly emerged from the Senate — the blowback from the right could be such that the ground for bipartisanship might well be scorched, if not salted, for the foreseeable future. Otherwise, a common-sense desire to salvage something positive from this long, nasty debate could survive and thrive.